At OCAD U, all students receive Gmail accounts via our agreement with Google and Google Apps for Education. This also includes access to Google Drive. "Google Drive is a file storage and synchronization service provided by Google, released on April 24, 2012, which enables user cloud storage, file sharing and collaborative editing." If you're a Student, you can go ahead and sign into your OCAD U Student Email account. If you are a Faculty member, you will need to create a Google Account that is associated with your existing faculty.ocadu.ca email account (click the link). You are covered under our our Google Apps for Education agreement with that email address. You can choose to install the Google Drive application on your home computer or mobile device which will synchronize your files. To learn more browse to Get Started with Google Drive. Canvas, Email and some other services have file size limits. Canvas has a file size limit of approximately 500 megabytes (MB) when it comes to uploading. In order to share or submit work that is beyond this limit such as large video files, you can either Reduce the File Size or you can use Google Drive to share the file. Please do not share confidential files with personal information this way: it's not secure. This article will illustrate this process. There is an icon consisting of nine small squares in the upper righthand corner. 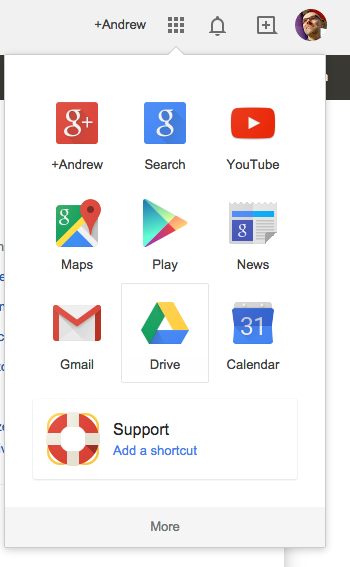 Click this icon to access a dropdown menu with various Google Apps icons. Click the icon for Google Drive. Once in Google Drive click the upload file icon on the left hand side of the screen. This will bring up a window where you can select a file to upload. Select the file from your hard drive that you would like to upload and click "Open". A window will pop up in the bottom righthand side of the screen which will show the progress of your upload. Once your upload is complete, click the share button on the right side of the window. A new window will opem and give you several privacy options for your file. In most cases Anyone with the link or People at OCAD University with the link will likely be the best option to ensure some level of security but also ease of access when sharing a file. If you want to only share with specific people you can select this option and then enter their email addresses in the next step after hitting save. When files are no longer needed you may wish to delete them in order to free up space in you Google Drive. This can be done by returning to your main Google Drive folder, clicking the check box beside the the file you wish to delete and then clicking the trash can icon at the top of the page. Your file should now be removed.